This year the Jumolhari Mountain Festival 2014 will be held on 8th and 9th of October 2014 at Dango Jong (School area), half an hour before Jangothang campsite (Jumolhari base camp). The festival celebrates the culture of the communities living in close proximity to endangered snow leopards. 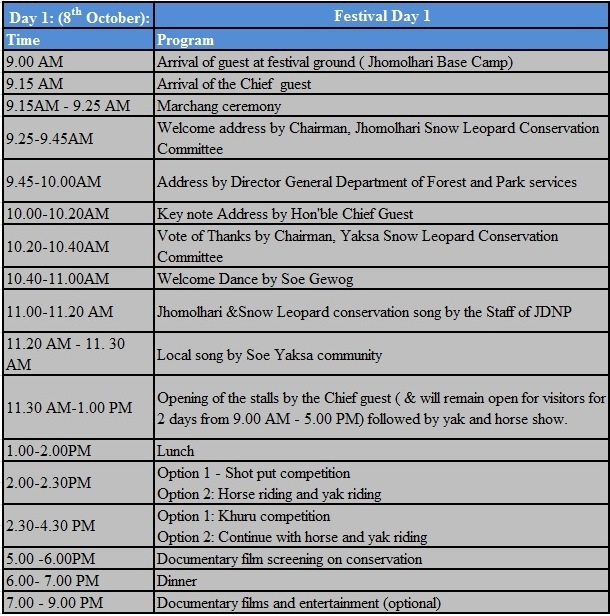 Jomolhari Mountain Festival is an exquisitely themed two-day event celebrated at the base of Mt. Jomolhari, by communities located along one of the most scenic trekking routes in Bhutan. The festival celebrates the culture of the communities living together with the natural wonders that surround them: one in particular, the elusive, yet elegant, snow leopard! This endangered cat thrives in the region; several camera trap photos and definite signs have established the region as one of the best snow leopard habitats in Bhutan. The communities of Soe Yaksa and Soe Yutoed, located along the Jomolhari trek, in collaboration with Jigme Dorji National Park (JDNP) and the Nature Recreation and Ecotourism Division (NRED) – with support from the Snow Leopard Conservancy (SLC) and Bhutan Foundation – bring together this festival as a community based initiative towards the conservation of snow leopard; to create awareness on the importance of conservation; engage and build on the perception and attitude to create harmony between this endangered cat and the people; provide a platform to bring in opportunities for sustainable livelihood, and promote their culture. 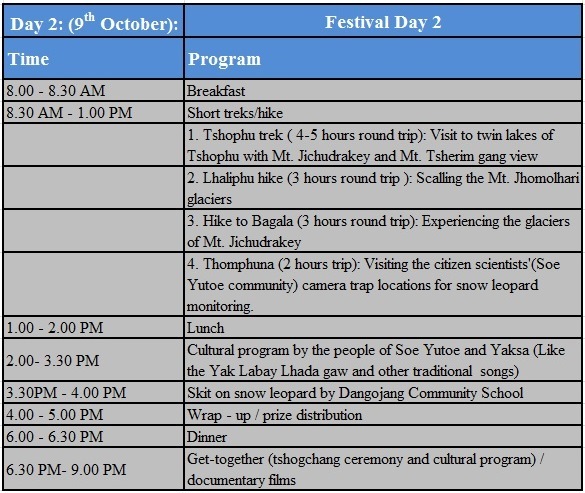 The festival includes snow leopard themed folk songs and dances performed by the local people, JDNP staff and the school children, traditional sports such as Khuru (darts), shot put, horse and yak riding, sampling of local delicacies and boutique handicrafts, and various picturesque guided hikes in and around Jomolhari. It also showcases various stalls set up by both local and international agencies to educate and promote conservation among those participating at the festival. The festival was initiated in 2013 and endorsed by the government as an annual event.